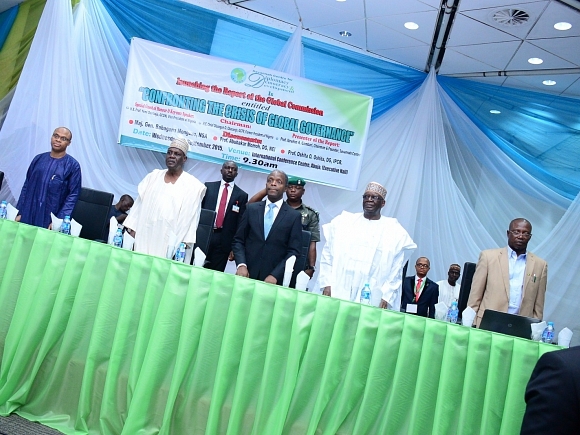 On Wednesday 9 September, the report of the Commission on Global Security, Justice & Governance, titled “Confronting the Crisis of Global Governance,” was launched in Abuja, Nigeria in a public event sponsored by theSavannah Centre for Diplomacy, Democracy, and Development (SCDDD). Following its initial launch in June at the Peace Palace in The Hague and subsequently at the United Nations in New York, the Abuja event marks the first of its kind in Africa. Event Chairman and former Minister of Foreign Affairs of Nigeria, H.E. Babagana Kingibe—representing former President Olusegun Obasanjo—welcomed the audience by stating that the report is “… an important milestone in advance of the United Nations 70th Anniversary Summit this September in New York,” and he highlighted its relevance to Nigerian and regional African concerns, as well as wider global challenges. L-R. Prof. Momoh, Rep.of fomer President Obasanjo, Amb. 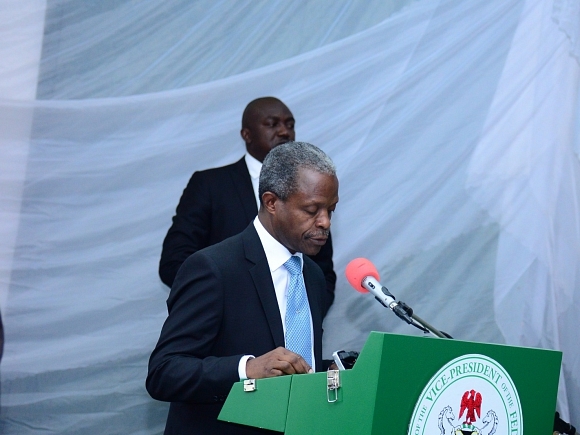 Babagana Kingibe, Vice President Prof. Yemi Osibanjo and Prof. Ibrahim Gambari. After an interactive session with the audience—which representatives from government, civil society, business, and the media—the event’s Chairman, H.E. Babagana Kingibe, closed the event with a vote of thanks to the participants, panelists, and the organizing sponsor, the Savannah Centre for Diplomacy, Democracy, and Development.